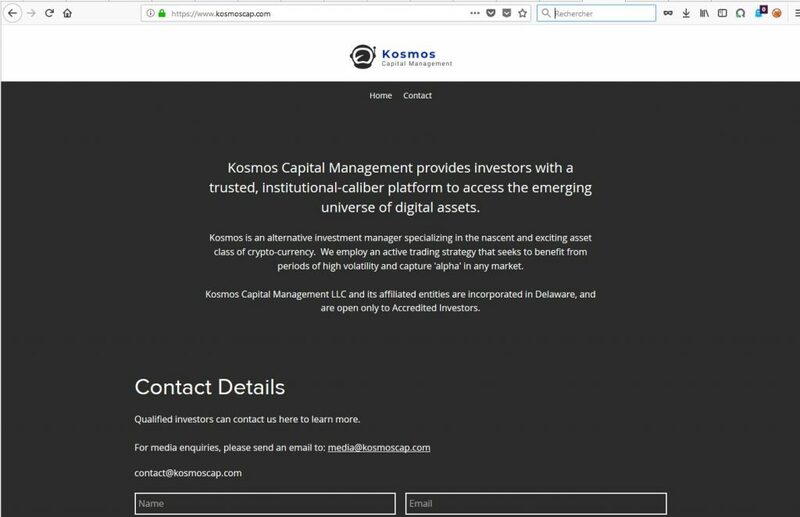 Le site de la prétendue société de gestion Kosmos Capital Manamgent dénonçant les fausses nouvelles en finance, est lui-même un faux, pour promouvoir une pure arnaque aux crypto-actifs bidons et autres bitcoins. Ah qu’elles sont belles les arnaques sur Internet ! Cette dernière fumisterie d’une prétendue société de gestion de crypto-actifs est particulièrement gratinée car elle surfe sur la vague désormais incontrôlable de fausses nouvelles (fake news) et complotismes les plus créatifs. Quoi de plus efficace pour se rendre intéressant auprès d’un public échaudé, que de dénoncer les fausses nouvelles ? D’innocentes cibles de l’arnaque reçoivent ainsi un courriel intrigant, sur le ravage des fausses nouvelles, pas seulement en politique mais aussi en finance. On est tenté de lire, pour savoir quelle nouvelle manipulation de l’information ces prétendus investigateurs auraient débusquée. Le début est toujours un peu mi-crédible, mais très vite l’oeil exercé lui trouve une tournure mi-crétin. Il s’agit en effet pour cet auteur de dénoncer les « mensonges en finance », qui feraient dire à des gens très crédibles qu’ils pensent que le Bitcoin est une belle supercherie financière, alors que, selon ces fameux « investigateurs », en fait en lisant mieux les propos des financiers crédibles déformés par la presse, on trouverait leur opinion pro-Bitcoin. Le tout est promu par une prétendue société de gestion américaine Kosmos Capital Management. Ah bon ? Alors allons voir qui c’est. 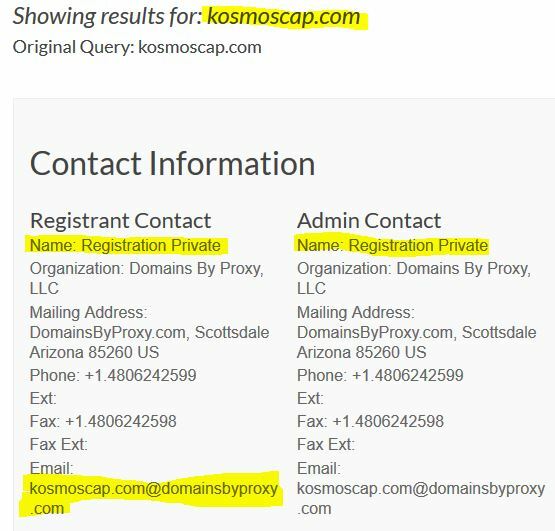 WHO IS kosmoscap.com. Deontofi.com le répète sans cesse, la seule vraie vérification fiable aujourd’hui de n’importe quelle info, promo, campagne sur internet, c’est l’annuaire mondial des adresses internet: le WHO IS. Et hop, en deux temps trois clics, c’est vérifié: il s’agit bien d’une nouvelle arnaque dans le seul but de collecter les coordonnées de futurs pigeons à dévaliser à distance. Whatever your political beliefs, most of us agree that US politics has a ‘fake news’ problem. At least that’s what you’re led to believe if you watch any of the hyper-partisan shouting matches that pose as ‘news shows’ in today’s America. The problem isn’t limited to politics, though. Lately fake news – or at least a highly biased and often fact-free reporting of news – seems to be growing in certain corners of the financial world. According to the article, Mr. Fink stated that “not a single client has ever asked us about crypto.” Gee, that sounds really negative. I guess these financial titans have already dismissed Bitcoin and other cryptoassets as irrelevant and unworthy of their time. But, before you run your paper Bitcoin wallet through the shredder, let’s go over to Hacked.com – a website that is popular with active traders – to see an alternative interpretation of the very same interview. 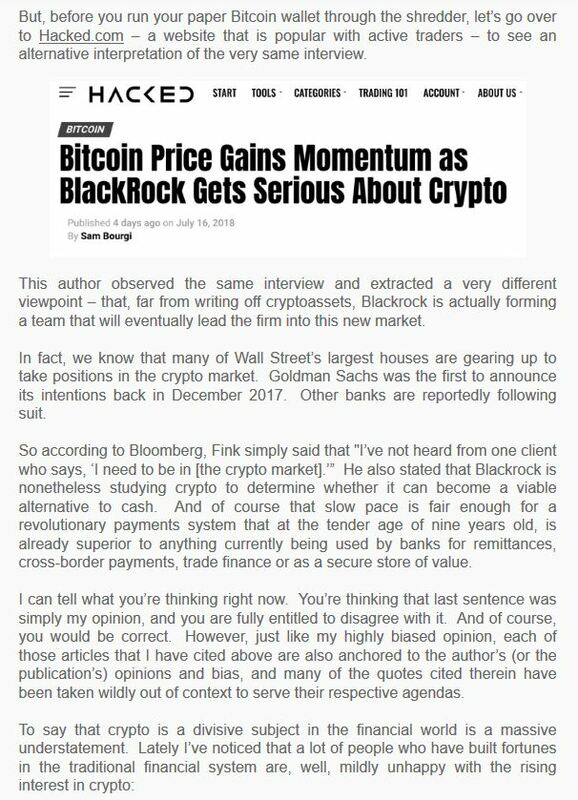 This author observed the same interview and extracted a very different viewpoint – that, far from writing off cryptoassets, Blackrock is actually forming a team that will eventually lead the firm into this new market. In fact, we know that many of Wall Street’s largest houses are gearing up to take positions in the crypto market. Goldman Sachs was the first to announce its intentions back in December 2017. Other banks are reportedly following suit. 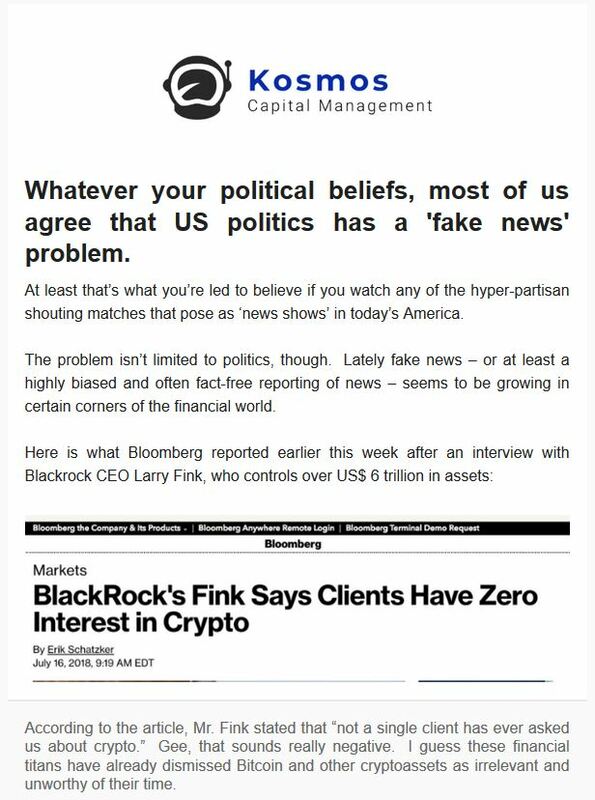 So according to Bloomberg, Fink simply said that « I’ve not heard from one client who says, ‘I need to be in [the crypto market].’” He also stated that Blackrock is nonetheless studying crypto to determine whether it can become a viable alternative to cash. And of course that slow pace is fair enough for a revolutionary payments system that at the tender age of nine years old, is already superior to anything currently being used by banks for remittances, cross-border payments, trade finance or as a secure store of value. I can tell what you’re thinking right now. You’re thinking that last sentence was simply my opinion, and you are fully entitled to disagree with it. And of course, you would be correct. However, just like my highly biased opinion, each of those articles that I have cited above are also anchored to the author’s (or the publication’s) opinions and bias, and many of the quotes cited therein have been taken wildly out of context to serve their respective agendas. 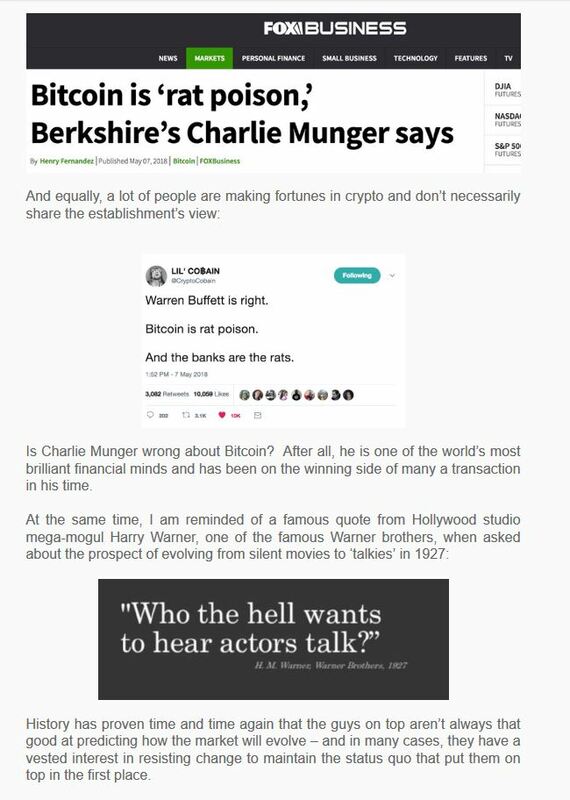 Is Charlie Munger wrong about Bitcoin? After all, he is one of the world’s most brilliant financial minds and has been on the winning side of many a transaction in his time. History has proven time and time again that the guys on top aren’t always that good at predicting how the market will evolve – and in many cases, they have a vested interest in resisting change to maintain the status quo that put them on top in the first place. Charlie Munger owns significant stakes in Bank of America, Moody’s, Goldman Sachs, Wells Fargo, Geico insurance, and many more financial behemoths. How much does he stand to benefit if market appetite for Bitcoin and other crypto-assets increases? Zero. Is he wrong? Maybe. Could a significant expansion of the crypto asset class eventually pose a threat to his net worth? Definitely. The moral of the story? In the current era of click-bait and fake news, don’t rely on headlines or supposed “experts” to form your opinions. If you want to learn about crypto, do your own research. And if I may so humbly suggest, clicking the button below to join the Kosmos mailing list is a great way to start. We’ll send you a non-spammy, no-strings-attached summary of crypto market developments every couple of weeks. We won’t try to sell you anything, and we won’t share your details with anyone – ever. Our company actively invests in the emergent field of cryptoassets. You received this email because I thought that you might be interested in an occasional update on our experiences in crypto – what we’re seeing, why we think a particular trend is worth keeping an eye on, or our thoughts on this fascinating new market. Let me be clear – this email is NOT a solicitation in any way, for anything. We are not trying to sell you a service, nor do we want to compete with Facebook in their efforts to sell your private information to China. Our only interest is in helping people to better understand the potential and pitfalls of crypto, which is shaping up to be among the most disruptive innovations of the 21st century. If this email isn’t for you, then simply click the ‘unsubscribe’ button below to be removed from further contact. You won’t hear from us again. On the other hand, if you are at the point where you would like to learn more about the crypto-asset market but don’t know where to begin, then we have an easy answer for you: just click the button below and stay tuned for further updates. This document is confidential and is intended only for the person to whom it has been provided. 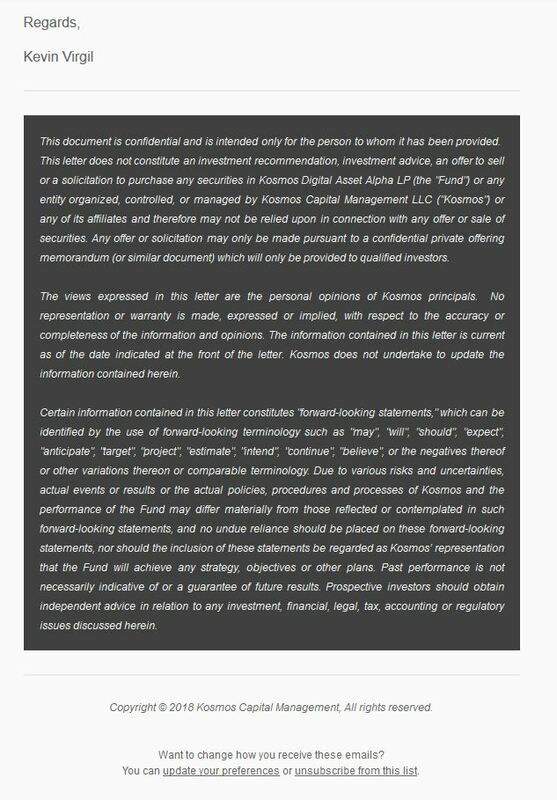 This letter does not constitute an investment recommendation, investment advice, an offer to sell or a solicitation to purchase any securities in Kosmos Digital Asset Alpha LP (the « Fund ») or any entity organized, controlled, or managed by Kosmos Capital Management LLC (« Kosmos ») or any of its affiliates and therefore may not be relied upon in connection with any offer or sale of securities. Any offer or solicitation may only be made pursuant to a confidential private offering memorandum (or similar document) which will only be provided to qualified investors. The views expressed in this letter are the personal opinions of Kosmos principals. No representation or warranty is made, expressed or implied, with respect to the accuracy or completeness of the information and opinions. The information contained in this letter is current as of the date indicated at the front of the letter. 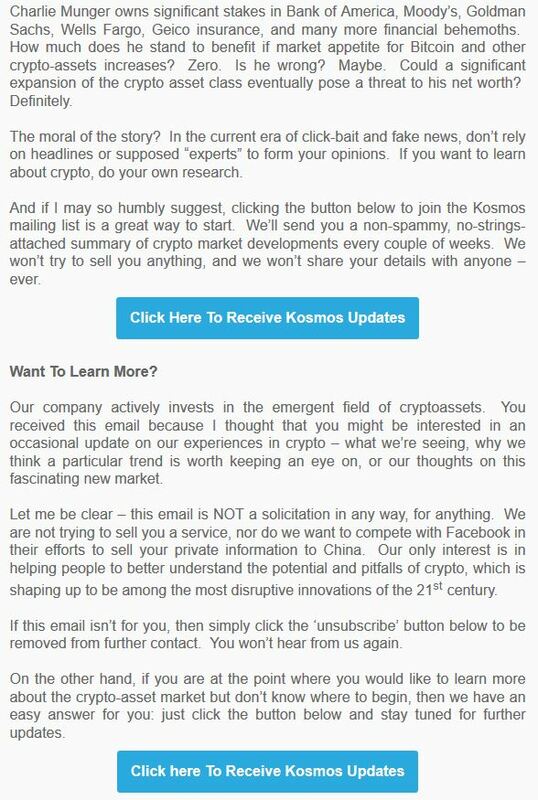 Kosmos does not undertake to update the information contained herein. Certain information contained in this letter constitutes « forward-looking statements, » which can be identified by the use of forward-looking terminology such as « may », « will », « should », « expect », « anticipate », « target », « project », « estimate », « intend », « continue », « believe », or the negatives thereof or other variations thereon or comparable terminology. Due to various risks and uncertainties, actual events or results or the actual policies, procedures and processes of Kosmos and the performance of the Fund may differ materially from those reflected or contemplated in such forward-looking statements, and no undue reliance should be placed on these forward-looking statements, nor should the inclusion of these statements be regarded as Kosmos’ representation that the Fund will achieve any strategy, objectives or other plans. Past performance is not necessarily indicative of or a guarantee of future results. Prospective investors should obtain independent advice in relation to any investment, financial, legal, tax, accounting or regulatory issues discussed herein. Copyright © 2018 Kosmos Capital Management, All rights reserved.